Spikes, Gaps and "Leading Take Profits"
Anyone who’s been sniffing around trading circles long enough knows about spikes and huge gaps and that stop losses will keep your losses to the maximum you establish unless, of course, the gaps and spikes blow right through them. Well, I don’t recall ever hearing about what I call “leading take profits” by means of which you might capture huge profits if a spike or huge gap occurs in your favor when you’re not looking. Without a take profit near the extreme level of the spike or gap, what could have been a huge profit will instead be flushed along with whatever you might have flushed when you were away from your computer because after such huge, quick advances price normally backs up to a level more in keeping with the market average. What to do? What if, at the same time you set your stop loss you also set a take profit to 4:1 or 5:1; and as price advances in your favor, periodically advance your take profit by the same amount? It’s like a trailing stop, but at the other end. Hence, a “leading take profit.” If price retreats, perhaps pull it back by the same amount. This method is easiest to implement if you don’t normally set take profit levels: all you’ll need is one take profit; but if you do normally set take profits, you’ll need to set an extra one beyond your normal level or levels. As I said, please don’t hold me to the details. I’m just flying the idea by you as a general concept. I would truly like to know what you think of the idea and what you think would be a good way of advancing the leading take profit and, perhaps, pulling it back. Sounds good. I actually don’t see spikes often - if by spike is meant a sudden move in prices which is just as quickly reversed - but I do quite often see unexpected positive price action. What I mean by a spike is price that shoots up or down a great distance suddenly, like an arrow, and it can occur seven days a week; and I assume, hopefully correctly, that one’s TP will be respected even over weekends when the action is blind to us. It took me 2 or 3 years of studying before I realized this simple, but potentially profitable technique. Glad my thinking out loud may be doing some good. i tried this on a demo account once and was actually underwhelmed by the results. However this might have been very well an issue with my implementation and not the idea itself. What i did was updating the TP every 10 Minutes to be a fixed amount ahead of current market price. This introduces some arbitrary variance already because the result depends on when you start your “Leading TP bot” and if you let it run every 10 or every 15 Minutes. All my trades were closed just when they started to go my way. And i think this issue will persist even with a better implementation. What a trailing stop does for you is letting you ride the trend and moves the exit to let you out when the trend goes against you. At least in theory. My impression was that the leading Take profit follows as the trend goes against you and closes your trade just as the trend starts to go your way. Thats why i did not pursue this. If you have a better implementation idea i would love to hear it. A way to automatically close a trade on a price spike is a good idea IMO, but my naive leading TP implementation was not fully up to the task. Perhaps I wasn’t clear enough. I never meant we should trade without a trailing stop. I always use a TS. But how about if, in addition to the trailing stop, we also implemented a LTP (leading take profit)? It seems like the issue is, at what R:R would we be happy to take our money and run? I suggested 4:1 or 5:1 just as examples; but at what point? 8:1? 12:1? 30:1? There’s got to be an R:R at which all of us would be happy to take our money and run with a smile on our faces. So with a well thought out trailing stop protecting our backs and a LTP moving ahead of price (like a TS moving behind price) saving us from a huge retracement up front after a large spike, I think that would be a very good winning combo. Norm, I’ve been thinking about the same thing.! Just putting a TP up in the stratosphere so if it does Spike … capture tremendous profit. Opportunity is always knocking… just have to be ready to take it! I’ve got into a habit of setting one click pending orders in mt4. Now i have to make a habit of setting that stratospheric take profit! This thread also sparked a thought that as well as taking profits by closing a running trade on a profitable spike, an order could also be set way below/above the current price to open a long/short position on a spike. This is something I do do! I’ll set pending orders deep in supply and demand zones hoping for that Spike up or down to collect orders. I’ve hit a few it’s a great feeling and good for the account balance catching these! I’ll set pending orders deep in supply and demand zones hoping for that Spike up or down to collect orders. I’ve hit a few it’s a great feeling and good for the account balance catching these! Obviously, this is a different concept than the moving take profit I suggested; it’s a means of initiating an order based on a spike. You said you’ve hit a few spikes like that that were good for your account balance. Would you care to share how you pull it off? How do you decide where to place your pending orders? Do you set them above AND below price whether you’re in an active trade or not, or just in the direction that you’re trading or that price is going? You place them “deep in the supply and demand zones.” Can you clarify? Let’s say you’re trading long on the daily frame, and a weekly resistance is a good distance above you and a monthly resistance is above that. Would you place your order just before the weekly resistance? The monthly resistance? Would it be a stop order to ride the spike in the direction it would be going, or a limit order to catch its retracement? As you can probably tell, I’m grasping at straws trying to phrase my questions the most appropriate way. If you can clarify how you go about setting your orders, I’d appreciate it. Just to clarify, are you talking about moving your TP further away as price moves in your favour? I remember reading a discussion about this a long time ago. A TP that’s designed not to get hit isn’t a TP at all. It might as well not exist if you don’t want price to hit it. As for stratospheric reward-to-risk ratios (e.g. 30:1), all of my backtests show that they are very unprofitable, at least on the daily timeframe. Maybe when daytrading with extremely tight stop losses (5 pips), they can work. Otherwise, just by nature of the forex market, you won’t see such large, extended moves. The stock market is probably better suited for this kind of price movement, since there’s a natural upward buoyancy. The forex market, on the otherhand, has no directional bias, so long-term price movement tends to be horizontal. Just my thoughts. Yes, move the TP further away as price moves in our favor by the same amount that price moves because a spike can move in that direction from wherever price is. It’s probably the case that such a spike is less likely as price advances because of the approaching overbought/oversold level, but I have yet to factor that into my thinking. If anyone can help me quantify or get a handle on that, I’d appreciate it. The TP is not “designed not to get hit.” The idea behind this TP is not the normal function for a TP. I use a trailing stop to grab profits. The idea behind this TP is to catch a very large profit if it’s hit by a spike. I was being hyperbolic and humorous when I used the 30:1 R:R simply to make the point that there is a R:R at which we’d all be happy to take our profit and run if hit by such a spike. 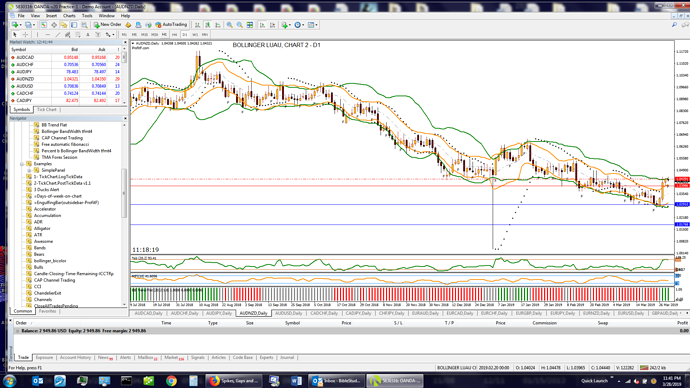 Here’s a 460 pip spike on the AUDNZD daily that took place on January 3. Similar spikes can be seen on other AUDXXX, and a 607 pip spike on GBPJPY, also on Jan. 3. I scrolled back on AUDNZD and found a 514 pip spike in August of 2015. Yes, the two spikes on the AUDNZD are about 3 1/2 years apart, so perhaps a significantly smaller moving TP should be placed ahead of price on the daily at a distance where we’d still be happy to walk away with the profit. Any further illuminating comments are definitely welcome. It seems likely ATR could be used to set SL’s and TP’s which are not specifically tied to fixed levels such as s/r. An ATR factor of X multiplied by ATR of y periods would continually adjust for changing prices, though manual re-setting would be frequently required. Where to place the pending order? I tend to set them below longs and above shorts. You could use the same thought process as is done for the TP; could be arbitrary, could be based on a weekly/monthly low/high, could be based on Price Action supply and demand zones. As @tommor noted a perhaps use the ATR. Referring to deep in a SD zone I simply mean at the outer most bounaries. What I have found myself tending to do depending on the depth of the SD zones is placing pending orders spaced from just outside, through the zone to the other side. Edit: BTW… This all has to be taken with a large GRAIN of salt as I am still a forex demo trader. While I take my demo account very seriously keeping it as “real” as possible in terms of starting balance, trading and emotional issues it is still a demo account. I am sure that there are live traders who would whole heartedly disagree with my approach. A TP that’s designed not to get hit isn’t a TP at all. I know I responded to Kevin’s statement, but I think I should clarify a bit more. Suppose I’m in a trade on the daily and see that price has advanced a significant amount, I would do two things: I would move my trailing stop closer to price and advance my moving take profit (set to catch a possible spike near its outer limits before it retraced) in the same direction. So what I’ve done is advance the price range fore and aft for the taking of profit, a winning combo so my profit would be increased whether the stop or the tp is hit. If I take a peek in another half hour, say, and price has advanced some more, I’d do the same thing. Now suppose while I was away from my computer price retraced enough to hit my advanced stop, or spiked enough to hit my advanced take profit way up in the stratosphere, I’d come out ahead either way. Well, I don’t know how I could make myself any clearer, so, as a certain people group here in Hawaii would say, “Nuff sedd!” Having said that, I’ll probably eat my words if I needed to explain again. I’m a nut job for thoroughness and clarity.